Chelsea Gardens paper (X7230B) and Mother’s Garden Stamp and Thin Cuts set (Z4164) creates beautiful cards and gift card boxes. It makes me think that spring has arrived! 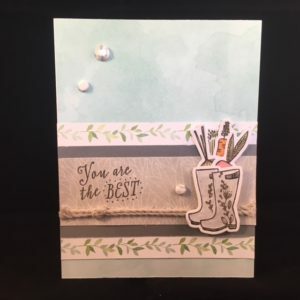 The card was created with the Chelsea Gardens paper along with Charcoal card stock (X5953) and embellished with Whisper twine (Z3095), Chelsea Gardens Dots and Gems (Z4155) and Chelsea Gardens zip strip. The Mother’s Garden Stamp and Thin Cuts were used for rain boot, vegetables and sentiment. All cuts were colored with ink and water color brush and popped up for some dimension. I love the soft color effect. The gift card box was created using the Gift Card Box Thin Cut (Z4150), Chelsea Gardens paper and Mother’s Garden Stamp and Thin Cuts set. The can and flowers were colored with ink and water color brush and popped up for dimension. The gift card box is just the right size for candy or a gift card. I hope you enjoy this card and gift box. Happy crafting. Very cute card and gift box. I love the vegetables peeking out of the boots 🙂 Thanks for sharing with us at Heart 2 Heart. 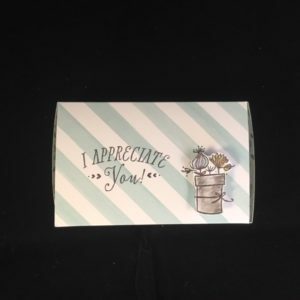 Very pretty soft colors on your card and gift card…beautiful. Thanks for sharing with us at Heart2Heart. Please join us for the March themes and earn a Perfect Attendance Badge if you enter each theme…love to see more creations from you. 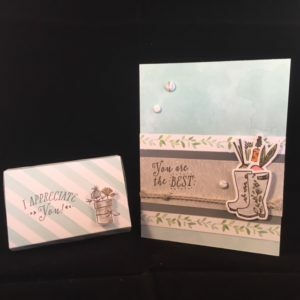 So glad you shared your pretty card with us at Heart 2 Heart! It really is a card that beckons spring! Great use of those Thin Cuts. So cute! I love all the cards! Thanks for playing along with Heart 2 Heart Challenges (H2H).